For those wondering who Lisi was extorting, “the accused made extortive efforts to retrieve a recording”. This is the full doc. Bitstrips Comics Dominate Facebook: Where Did They Come From? Great post from Steve Munro arguing for a rebranding of the Downtown Relief Line, and for it to run all the way to Eglinton & Don Mills, to prevent the misconception that it is a line for downtown “elites”. More detail on his own site as well. There is probably going to be some (partially) juicy Rob Ford news tomorrow. It’s so much lighter that it’s a credible alternative to the Mini for a light, portable iPad. Well that makes for some challenging decisions. Not a surprise to the sci-fi reader, but telling that this is the stage we are now entering. Today I have read articles about a programmable robot for four-year-olds and how soon we will be wearing ten computers each. It is time for small-scale AIs, computer learning, swarms of little, cheap devices everywhere. 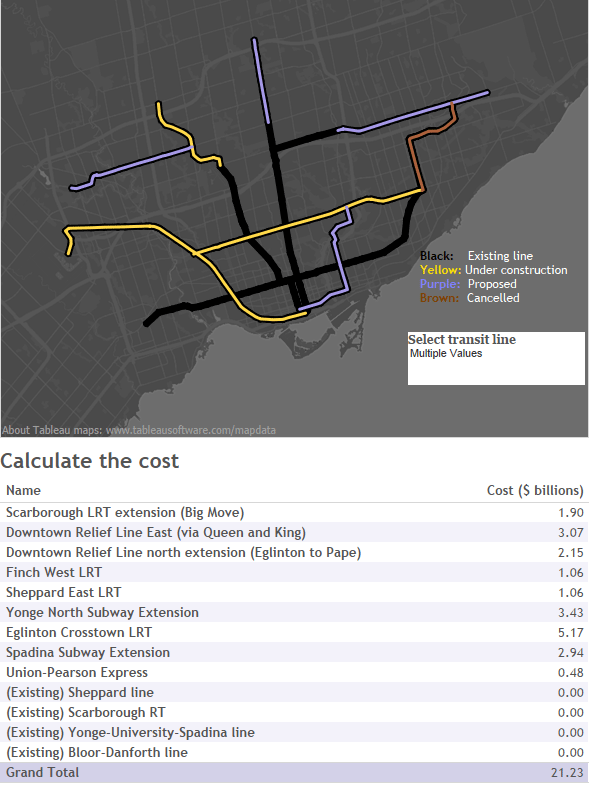 Here’s a fun transit construction doodad that allows you to participate in the great lines-on-maps-that-never-amount-to-anything fantasyland of Toronto transit planning, by choosing which Toronto transit lines to build, talling up the cost, and then getting discouraged and building nothing. Mine is below, and is fairly conservative, if a complete pipe dream – all currently underway Big Move projects, replacing the Scarborough subway extension with the originally planned LRT, and adding the eastern jag of the DRL. So really only $5-billion of extra construction, despite what the thing says. The big question mark is what in the hell we are doing building this Pearson-Union Express nonsense when it could probably function as a proper transit line and do a lot more good. Stories like this (and this) have led me to scale back my use of Google services. I think I’m only using Gmail and search now, down from many more. Also, police were probably surveilling Siad when he showed the crack tape to Gawker’s John Cook. Do these articles mean that some of the Traveler documents are now unsealed? Not a whole lot of Saoirses out there. The biggest enemy of LRT in Toronto isn’t Rob Ford, or some suburban subway fetish, or a mistrust of surface rail. It’s the technology’s own vague identity. In Toronto, we know what subways are, and we like them. That’s because we have two well-run lines that are the backbone of our aging transit network. The trains come frequently, and they run fast. Given traffic issues, the subway is often more reliable than driving. Dedicated rights of way, multiple cars and low-to-the ground operation tend to be important. Wider-spaced stops and all-door boarding are other common features of LRT lines. LRT speeds average 27km/h, closer to that of subways (32 km/h) than streetcars (17km/h). Many LRT systems operate off-street, in their own corridors and with their own stations, more like a subway than a Toronto streetcar line. Essentially, LRT is something you can build in areas with less density, areas which don’t yet need the expense of the subway, but need something better than buses or streetcars. Opponents in Toronto have managed to tar LRT with the brush of two less-loved technologies: streetcars and the SRT in Scarborough. The SRT is a type of light rail, but a very poor implementation of it, based on an unproven (and now discredited) technology, ICTS. It is loud, unreliable, and slow. Streetcars have been running in Toronto since 1861 and were the backbone of our transit system for almost a century. Their modern implementation, however, is marred by old, unreliable cars, poor route management, and – more than anything else – by their operation in mixed traffic on some of the most congested streets in the country. The TTC itself has muddied the waters around LRT, often affixing the name to streetcar-based projects like the Spadina, Harbourfront and St. Clair streetcar lines. Combined with the poor state of the streetcar system and of the taxonomically-similar SRT, it’s no surprise that LRT has gotten a bad name. Things may change once people are able to take a ride on the Eglinton Crosstown LRT (currently under construction), which will run underground for most of its length, and which has subway-like stations (although more closely spaced). Unfortunately, that won’t be until 2022 – and transit advocate Steve Munro is worried that if the current irrational trajectory of transit debate in Toronto continues, even the crosstown line could get torpedoed. Before then, those who want a rational transit network in Toronto will have to paint a better picture of LRT – or we will be paying for expensive, underused suburban subway lines like Sheppard and the prospective Scarborough extension for decades to come.